Here are some photos from Gymnasium Wandlitz. Gymnnasium Wandlitz won an award from the U.S. Embasy in Berlin because of its international programs. 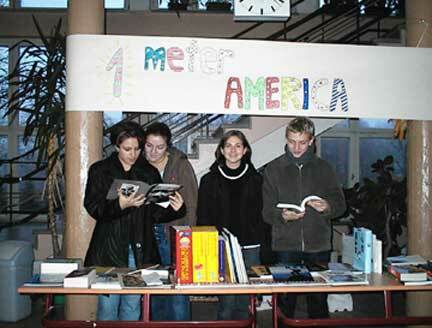 The award, called "One Meter America" included a donation of books about the U.S.A. 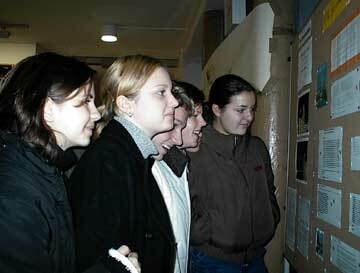 The school has partner schools in many countries, including one in the United States - Kingman College in Arizona. Stefanie Duske, Jasmin Reitzig, Sebastian Gross, Judith Zehbe and Isabel Schoning read e-mail from Blair students that are on display, Silver International staff members and students in Mrs. Silvio's Spanish classes have been communicating with students in Wandlitz. Students in Gymnasium Wandlitz, a high school in Wandlitz, Germany, have sent letters about their Christmas customs. Short selections from their letters are below. Christmas time begins in Germany at first is "Advent." It is a tradition that starts four Sundays before Christmas Eve. December 6th is a special day for children. They have to clean their shoes for the little brother of Santa Claus. He is called Nicholas. He comes in the night and nice children with clean shoes get little presents or sweets. Bad children with dirty shoes get a switch. At first we light one candle on every "advent." In Germany, they are four advents. The first one is on the first Sunday in December. The second one is on the second Sunday of December and so on. Traditionally we eat "Christollen". it is a kind of cake with raisins and icing sugar. On the sixth of December it is St. Nicholas' day. That's when the children get some sweets and little present in their shoes. For this day, they must clean their shoes the evening before. From December 1st to December 24th we open a door of our Christmas calendar every day. On every Sunday in December before the 24th we light a candle at night. During December till Christmas we children get a calendar with 24 small doors. Behind every door is a small present. When they open up the 24th door it's also the Christmas Eve. Christmas in our country is quite traditional. We get up early and after the breakfast, my father and my brother buy a Christmas tree and a carp. My sister and I bake cake and cookies. My mother helps us and she also prepares everything for the carp and tidies up. When the men are back we start decorating the tree. We put the presents by the Christmas tree and decorate it in the living room. But our little sisters and brothers have to stay in their rooms until lunch. The teenagers go out with the small children, go sledding and have a snowball fight so the adults can decorate the house and make the Christmas dinner. On December 24 in the afternoon at 4 o'clock it's tea time and the whole family is there. When we're finished eating we go for a walk. During the walk, Santa Claus comes. He brings the presents, lays them under the Christmas tree. On Christmas Eve, we mostly go to church and sing some Christmas songs to get the real Christmas feeling. After this we sit together with the whole family and have tea time. We talk until it's knocking. That means Santa Claus (my father) is coming to bring presents. We make that old tradition for my little cousin. Before we get our presents we have to sing a song or say a poem. Then we have our evening meal and after the meal we will watch a film and go to bed. After everyone gets their presents, we eat together. For a few years we ate the same on Christmas evening. I don't know if you know that. It's not traditional. Translated, it is called "hot-stone." It is really a hot stone plate. People can put on it little meat pieces, vegetables and other things. With it we eat bread and there are a lot of sauces. If we don't sing or say anything, we don't get our presents. That's very sad. And that's very awkward. After eating, my dad has to drive to work because he has to make two church services. My great-grandfather, my mother, my two sisters and I drink coffee and eat cake. Then we go together (without my great-grandmother) to the church service. After it we go home. My dad comes, too, and then he goes in the living room to play the piano. After a few minutes we go in the living room and give each other the presents.